~ Yharma ~: New to Tunisian Crochet! Just finished my first project AND learned a new skill! While it was as easy as I had expected, I did have to refer to one book and one YouTube video to get me through it. 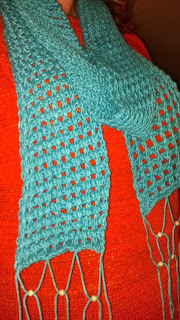 The pattern I used was Tara’s Tunisian Scarf with Sirdar Snuggly Baby Bamboo DK yarn in turquoise. OK, it doesn’t look EXACTLY like the picture, but close enough. After all, I'm not a perfectionist and 'Close Enough' is one of my mantras... it makes life so much easier! 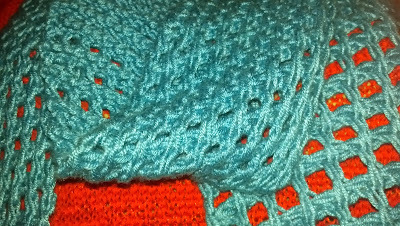 One side of the scarf is much stretchier than the other which gives a somewhat diagonal look (I actually kind of like that) and the reverse side is every bit as nice as the front - bonus! All in all, I’m very happy with the results. 1 1) It’s super easy, especially if you already know how to crochet, although it’s a bit more complicated (but not much). 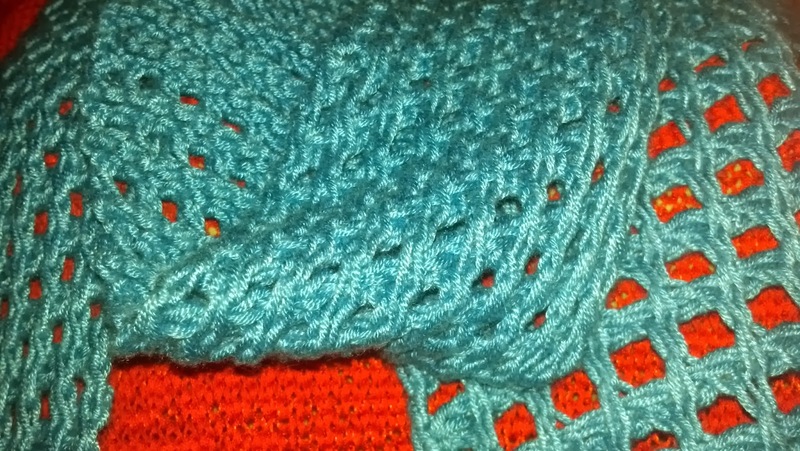 2) It’s a bit monotonous… you crochet stitches onto the hook, you crochet them off of the hook. Kind of like wax on, wax off for Karate Kid fans. 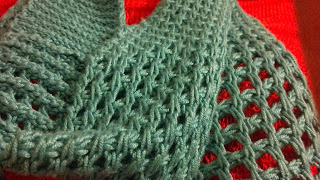 But does the monotony come from the Tunisian Crochet technique itself or because it was a scarf and scarves are typically boring? This may require more investigation. 3) It’s super quick! Once I got the hang of it I flew through the project. And the best part is that if you screwed up, you just had to rip it out to the beginning of the 'wax on' row where you only had one stitch on the hook and take it from there. 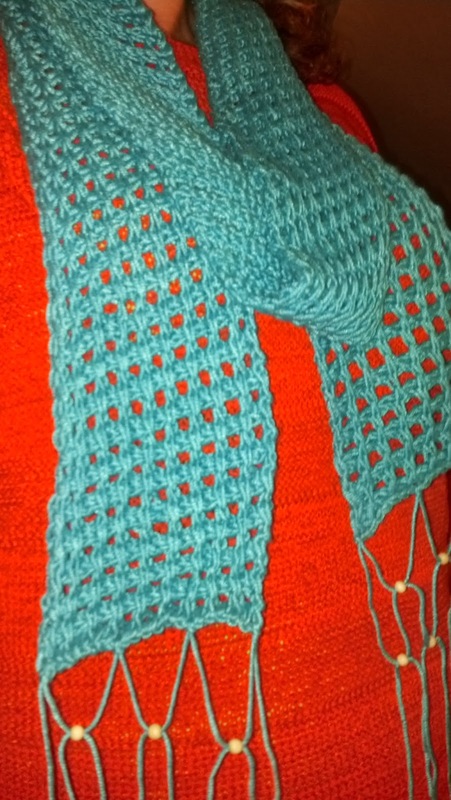 4) I love the look and the weight, heavier than knitting and more dense than typical crochet. I blocked it last night (well as much as you can block bamboo) and added some beaded fringe to jazz it up a bit and really love the results. My conclusion? I need to break out the Tunisian Crochet book I bought and try a pattern that’s more challenging. There's an afghan in there with several different stitches and a sweater that I absolutely adore. 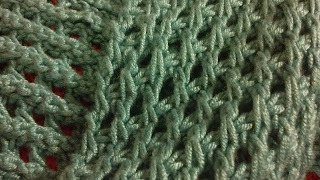 Someone at our knitting group last week said that she had great results doing Tunisian Crochet Entrelac, but I’m not sure I’m ready to try that. 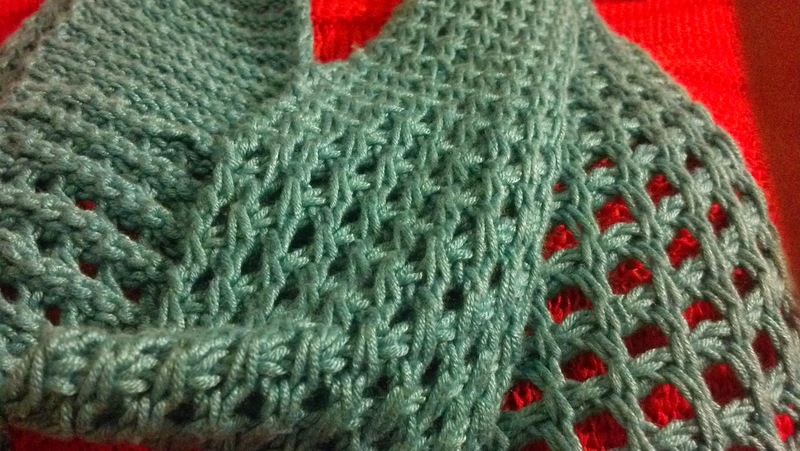 Mostly because I don’t want to spoil the fun of the knitting Entrelac class that I’m taking at the end of the month. I know that makes absolutely no sense since they are two different techniques, but somehow it would feel like cheating. Photos are taken with and without flash. 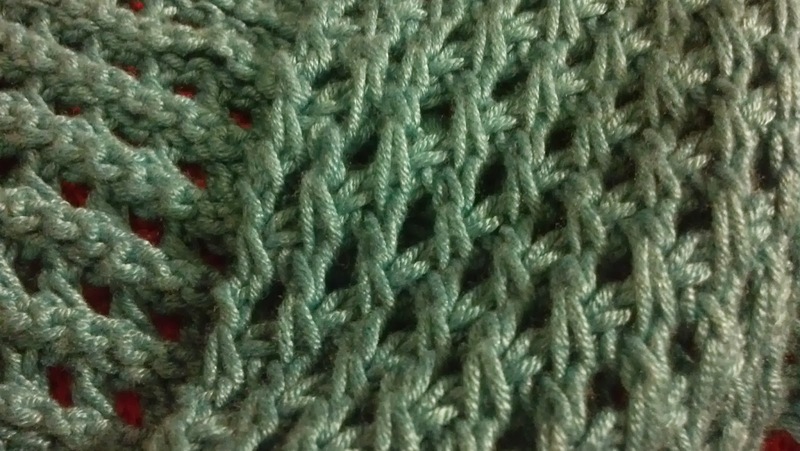 The flash shows off the color better but I think the stitches are more distinct without it.